Best age for buying a GSD ? What's the best age for buying a dog ( IT'S THE FIRST TIME FOR ME TO OWN A DOG ) ? People say that the best age is 6-7 Months so he can be trained and took all the vaccines ..
Others say buying a pup 1-2 months is the best way the dog get used to his living place and the his family ! I don't know which is right and which is wrong. 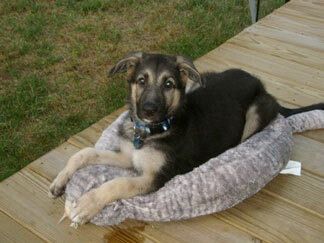 Personally I think any age GSD (after 8 weeks) can be the right age to bring into your life. Now with that being said let me clarify that by saying that you really need to match the age of the German Shepherd you bring home to fit you and your home and your needs. Maybe you have needs for an older dog because you don't want to go through all the puppy teething, housetraining, etc. issues - and that's all right if that is what you really want - because there are loads of older German Shepherds out that there need a good and loving home. I would have to say though that maybe a first time owner would do better with an older, calmer German Shepherd. Check with your local rescues and shelters for potential companions. Then again, maybe you do want a puppy instead of an older GSD - maybe you have other pets and kids that you want the puppy to grow up with that might not accept an older German Shepherd easily. And you're willing to go through weeks of teething, housetraining and the whole nine yards. And that's all right too. Truth be told, you really need to assess your own situation and your needs - not necessarily your wants - about what will be the best pet for you - an older GSD or a GSD puppy. Make a list about what is good and bad about each choice for you and your own situation and then decide based on your findings - and if you need help, talk to a parent, roommate, wife/husband, etc. Both can make good pets in the right home and both have very specific, but different, needs. But for a first time owner an older GSD would be a great choice. Either way, training and socialization will be very important too. So take your time, think it through and good luck getting your new German Shepherd.